An artist’s rendering of 12 black hole binaries at our galaxy’s center. Astronomers have long predicted that as many as 20,000 black holes could be hiding in our galaxy’s center, but so far no one has been able to spot them. Until now. A Columbia University-led team of scientists dug through data taken with the Earth-orbiting Chandra X-ray Observatory to find the objects. They managed to find a dozen characteristic x-ray sources spewing energy from the galaxy’s inner three light-years. This is the first time anyone has observed these black holes. The center of the galaxy has a lot of stuff, including a black hole 4 million times the size of the sun called Sagittarius A* (“A-star”) along with lots of stars. But if you’ve been paying attention to some other physics discussions, there are places in the universe that researchers predict have lots of smaller black holes. These are super-dense objects tens of times the mass of the sun whose gravity even light can’t escape. Hailey’s team used a tried-and-true tool on Chandra called the Advanced CCD Imaging Spectrometer I (ACIS-I), which has looked at the galactic center for a total of two weeks over the past 12 years. There’s a lot of stuff in there, so they needed to come up with a way to pick out just the sources they were looking for. “These were all catalogued sources, but the Chandra catalogue just gives you a source and a brightness—it doesn’t tell you what it is,” said Hailey. 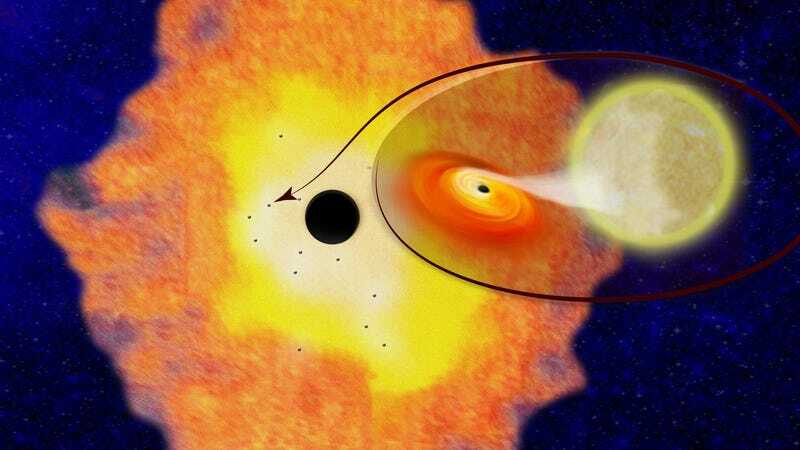 The Milky Way’s central black hole, with the x-ray sources in blue. Graphic: Nature and Hailey, et. al. Specifically, they were hunting for stars being sucked up by the black holes they orbited, causing the black holes to spit out x-rays. Despite the incredibly crowded region, the researchers found a dozen of these examples by looking at ratios of higher-energy to lower-energy x-rays in the data. They published their results today in Nature. This data could also help other astronomers predict how often they might see gravitational waves. If a pair of black holes collided in the Milky Way, gravitational wave observatories like LIGO’s readings would be off the charts, said Bartos (“We’d have trouble with our detectors.”) But if every galaxy has black holes at its center, perhaps observatories like LIGO would spot relatively strong events every few years from our galactic neighbors. This is just the first evidence. The scientists only found 12 of these sources, but they conclude that there could be thousands based on an extrapolation. Hailey also said that up to half of these objects could be millisecond pulsars, neutron stars emitting a beam of radiation and rotating once every few milliseconds. But even that would be important to astronomers, since millisecond pulsars are a proposed culprit behind an excess of gamma rays observed by the Earth-orbiting Fermi-Large Area Telescope.